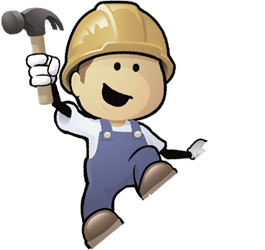 Window Replacement, Window Repairs and even New Construction! 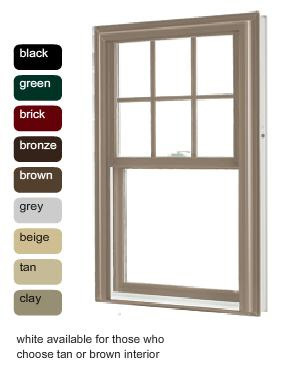 We carry many styles of windows and colors to choose from and are distributors of more than 20 manufacturers. 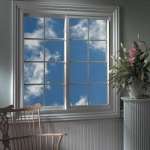 To learn more about basic styles of windows click here. We offer the Easton Series and the Hyde Park Series. Attractive details and worry-free performance. Energy efficiency with superb style. Engineered durability and a Lifetime Warranty.  Solid color-through virgin vinyl maintains a natural appearance and will not chip, peel, corrode, rot or requires painting or scraping.Easton windows from Vinylmax meet all the industry standards for strength and durability. Rest assured that your investment in quality and beauty will protect your home and your family for years to come. Vinylmax offers one of the strongest Limited Lifetime Warranties in the industry, and guarantee performance and satisfaction that will last a lifetime. Independent testing certifies Easton windows to excel at resisting air and water infiltration. Condensation and sound transmission are greatly reduced as well. Double Hung, Slider, Picture Window and Patio Doors Additional coordination products maybe available, including Bays, Bows, Garden Windows, Geometric Shapes. 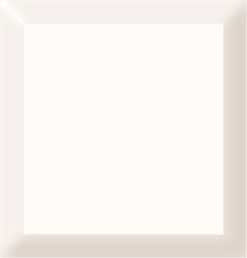 Prairie 9 – perimeter grids that frame each glass area, Diamond (white and tan flat only) Old world charm. 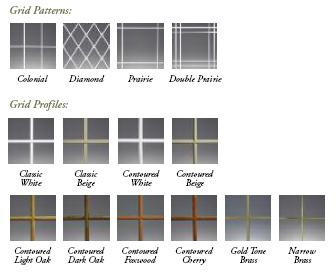 Patterns vary according to window style, size and even your preference. Additional decorative options may be available, including Simulated Divided Lites, Beveled/Leaded Glass, Stained Glass. Between-the-glass grids are securely locked in place. Screens: Operations windows feature Low profile extruded screen frames that cover the opening (half screen). Heavy duty half screens and full screens that cover the entire frame are also available. 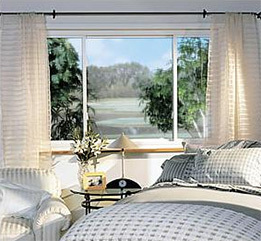 All Easton windows feature BetterVue improved visibility insect screen mesh. Hardware Finishes: Color matched hardware. 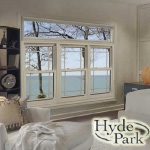 Combined attractive, finely-crafted details with superior warmth, performance and durability to bring you the truly unique Hyde Park series of premium vinyl replacement windows. The Details make the Difference. Double Hung, Slider, Picture Window, High Pointe Patio Door. Additional coordinating products may be available, including 4 and 5 lite casements, Bays, Bows, Garden Windows, Geometric Shapes. 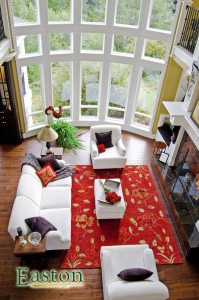 Patterns vary according to window style, size and even your preference. Hardware Finishes: Coordinating designer hardware. 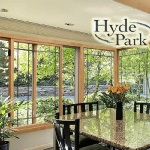 Glass: Hyde Park windows feature our proprietary IntelliGlass high performance Low E with Argon Fill. Additional glass types may be available, including Tempered, Obscure, Tinted, Laminated. 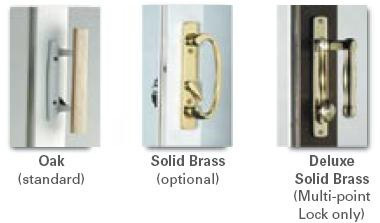 Integrated interlock system eliminates drafts and provides secure protection unwanted elements. Dual weatherstripping at the meeting rail supplements the design, providing the ultimate protection against air infiltration. Self-leveling sealed bearing roller system is whisper-quiet and butter smooth. Die Cast weather resistant handle set in several decorator finishes features a mortised mutlipoint lock with key. Integrated anti-slam mechanism eliminates accidential hardware damage. Ample weatherstripping consists of synthetic wool pile with mylar fin strip that guards against air and water leakage. 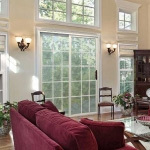 Double paned IntelliGlass tempered Low E Glass enhances energy performance, insulation and reduces soung transmission. Heavy Duty extruded locking screen door stand up to even the heaviest traffic. Patented UltraVue screen mesh increases airflow and improves insect protection by utilizing a smaller mesh opening and thinner fibers than standard screens. This allows 25% more light, and fresh breezes to flow through while protecting against insects of every size. Steel reinforcement of vertical members ensures structural integrity. Neutral wood interior handle and powder-coated matched exterior handle blend seamlessly with any style and lock securely. Self-leveling tandem steel rollers are adjustable for easy functionality that will last a lifetime. 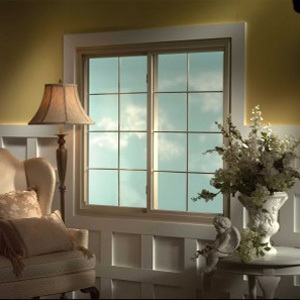 Double paned tempered glass enhances insulation and reduces sound transmission. Patented Bettervue screen mesh increases airflow and improves insect protection by utilizing a 30% smaller mesh opening and thinner fibers than standard screens. The result is higher light transmittance, improved curb appeal and a significantly clearer view from inside or out. Available in 2 panel door, fixed panel and transom. Custom sizes also available. Colonial Grid Pattern or Prairie Grid Pattern. Optional IntelliGlass high performance glass. This combination of Intercept Warm Edge Spacer System, Low E Glass and Argon Gas provides both energy efficiency and beauty to your home. Optional Features: Upgrade handle set with key lock. Choose Brushed Nickel or Oil Rubbed Bronze. Optional IntelliGlass high performance glass. Double paned to reduce energy cost. Color matched handle set – Won’t deteriorate. Secure thumb latch. Rolling screen door included – fiberglass mesh keeps pest out. Three Panel doors, Integral Transoms & Fixed Panels available. Optional Features: Heavy Duty Screen, Toe Lock, Key Lock. 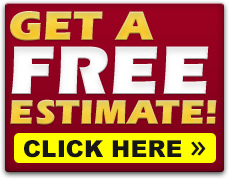 Polaris UltraWeld replacement windows – Ultimate Window and Door System. 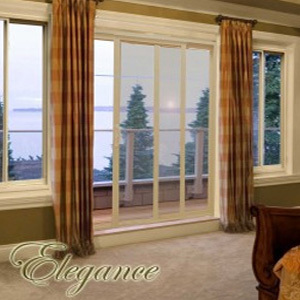 They combine maximum thermal efficiency with beautiful looks and a host of options to make your windows your windows. UltraWeld windows are ultra strong, ultra efficient, clean up ultra easy are backed by and ultra warranty. When it all comes down to it, UltraWeld windows are, quite simply, the best. Comfort, energy efficiency, ease of operation and ownership are built into every Polaris UltraWeld Window. Tough Polaris vinyl extrusions are “ultra-welded” as every corner to create seamless and strong windows. Polaris energySmart glass is standard along with many other energy saving features. 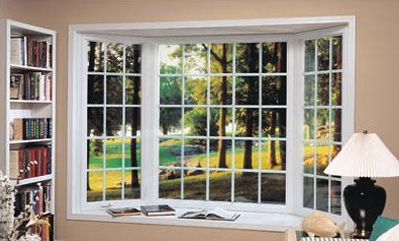 Your new vinyl windows will retain their pristine appearance and weather tight barrier for a lifetime. Polaris vinyl is the perfect patio door material. Vinyl formulation will not pit, chip, rot, warp, peel, blister or split. Vinyl does not transfer cold from outside to inside. Vinyl retains its color because color is molded throughout. Quality, energy efficiency, ease of operation and ownership. These features are built into every Polaris product. 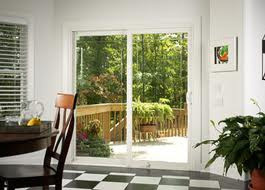 You new vinyl patio door will retain its pristine appearance and weather tight barrier for a lifetime. When door contracts frame steel hooks automatically lock at two additional points along the frame. Are the same for the patio doors at noted above. EnergySMART glass is standard in every UltraWeld window. These insulated glass (IG) units are panes of glass sealed onto a U-shaped steel spacer. Together, the spacer and sealant block temperature transfer. Upgrade your glass for even greater energy efficiency. EnergySMART Supreme and Ultimate Plus high-performance glass options have a greater resistance to temperature transfer and also reduce ultraviolet light transmission. Both are ENERGYSTAR qualified.  The ValuSmart collection – vinyl replacement windows – energy saving, maintenance free windows at an economical price.  Polaris vinyl compound retains its pristine appearance for a LIFETIME. 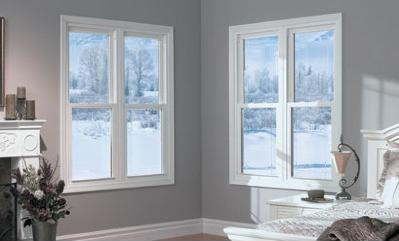 The ValuSmart Series 1000 Double-Hung window provides high energy efficiency, limited maintenance, and traditional window look, at an economical price. They are standard with fusion-welded corners on the frame and sash, easy-to clean tilt-in sash, and a true position balance system. 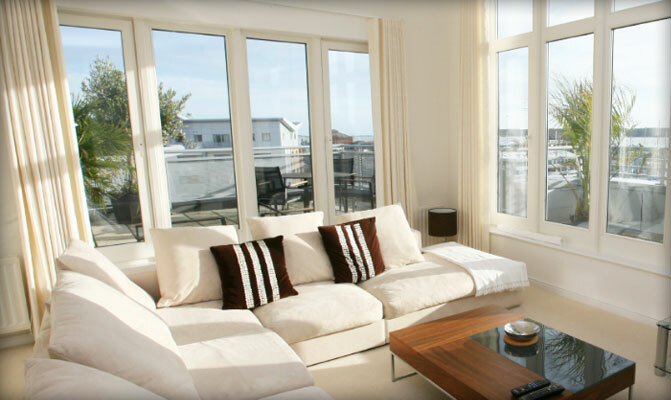 They combine maximum thermal efficiency with beautiful looks and a host of options to make your window your windows. energySMART SURREME and SUPREME2 Low-E glass coating reduces ultraviolet light transmission. Argon gas fill between panes resists temperature transfer. ENERGY STAR QUALIFIED. Intercept – Standard intercept Warm-Edge insulated glass space system blocks temperature transfer for Thermal Performance and reduces condensation.  INTERCEPT/LOW-E/ARGON – Low-e coating reduces damaging ultraviolet light and temperature transmission. Argon gas filling between panes resists temperature transfer. 3 standard sizes and one decorative glass option/ contour grid. A beautiful combination of style and comfort. The real beauty is in how they operate. Patio doors are designed with an adjustable screen tension system that helps keep the screen in its track for beautiful performance, even in high traffic areas. Whether your de’cor is traditional, contemporary, or even transitional, Alside offers the patio door to suit your needs. From interior woodgrains to multiple configurations, all patio doors are engineered for ease of operation and aesthetic appeal. Mainframe and sash extrusions will never chip, peel, crack or warp. 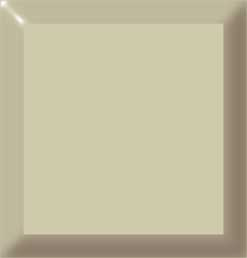 Made tough and solid with virgin vinyl (PVC) resin, their color is formulated throughout so the beautiful luster lasts. 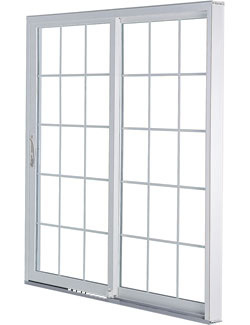 Alside 6100 Series Patio Doors are available in white or beige interior colors. 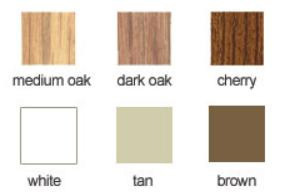 For the appealing look of natural wood, choose optional light oak, dark oak, foxwood or cherry woodgrain finishes. A white woodgrain interior is also offered with a beige exterior only. 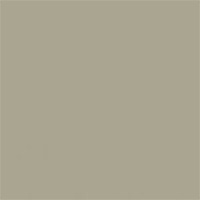 Standard exterior colors are white and beige. An optional American Terra exterior is available with a white or beige interior finish. Decorative grids lend an added measure of style and dimension to your windows. all grids are enclosed withing the insulated glass unit for easy cleaning.  Classic Grids – available in Colonial, Diamond, Prairie and Double Prairie patterns. Contoured Grids – available in Colonial, Prairie and Double Prairie patterns. Gold Tone Brass Grids – available in Prairie and Double Prairie patterns. Narrow Brass Grids – available in a Colonial pattern. Add a cut or polished V-grooved glass pattern to your patio door for the perfect touch of elegance. For maximum energy savings, upgrade your Alside Patio Door with a ClimaTech insulating glass package, featuring Low-E glass, argon gas and the PPG Intercept Warm-Edge Spacer System. The superior thermal performance of this insulating glass unit can help lower your energy costs while further reducing the consumption of fossil fuels. Together they can cut the damaging effects of the sun, Which can lead to the fading of carpets, curtains and furniture, by an additional 72% over clear insulated glass units. In winter, a warmer glass temperature is maintained, increasing the R-Value by an additional 104%. In summer, up to a 49% reduction in solar heat gain helps cut air-conditioning cost. Keyed exterior lock, Interior vent foot lock, and brass interior handset. 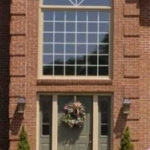 Buckeye Home Services offers a large selection of window styles in Dayton, Ohio. Choose from a variety of colors and shapes. Our selection includes 20 different manufacturers. An awning window is hinged at the top and opens outside your home with a crank handle. A geometric window is any window that is not a rectangle. Most are fixed, but some may operate. 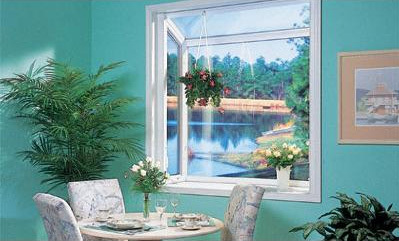 A garden window simulates a greenhouse and projects outside your home. It features a slanted glass roof, shelving for plants or accent pieces, and casement side windows. A hopper window is hinged at the bottom and pulls inward. 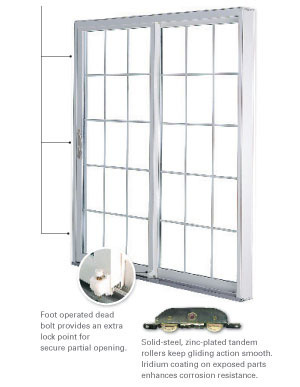 A patio door consists of two or three panels and one panel rolls on a track for opening. 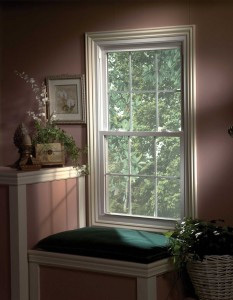 A single hung mimic the visual style of a double hung, but the top section does not operate. 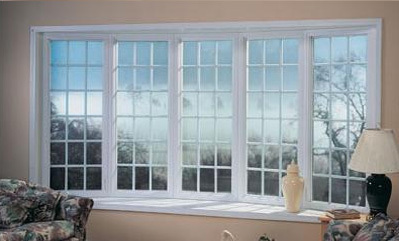 A slider window consists of two or three side-by-side sections. At least one of the sections rolls or slides from side to side in a track.